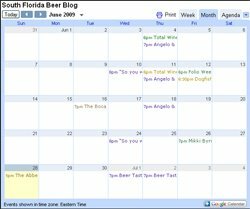 South Florida Beer Blog: Happy New Year!!! I just wanted to wish all of my readers a Happy New Year. I hope that 2011 brings great things for all of us and in honor of that, I'd like to share a video that blew my mind. Now this is progress at work. GrinOn Industries has designed and fabricated what they call the Bottoms Up Draft Beer Dispensing System. While slow crafting, small and often limited releases from small breweries is what we celebrate here, getting a cold beer quickly and perfectly poured is a slice of heaven we all look forward to. Happy drinking (responsibly).